Photo: Isaac England House, ca. 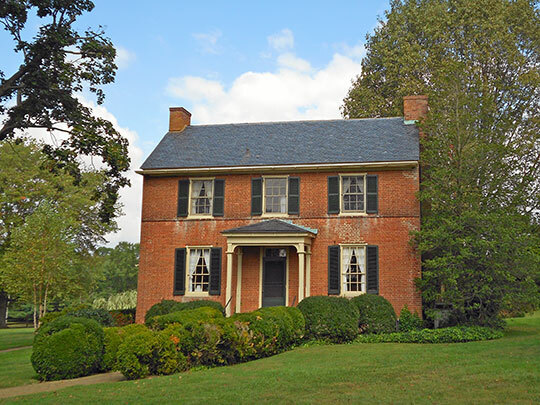 1812, 1000 Crothers Road, Zion, MD. Listed on the National Register of Historic Places in 1980. Photographed by User:Smallbones (own work), 2013, [cc-by-3.0 (creativecommons.org/licenses/by/3.0)], via Wikimedia Commons, accessed May, 2014. Cecil County Government offices are located at 129 East Main Street, Elkton MD 21921; phone: 410-996-5201. Cecil county, named in honor of the second Lord Baron of Baltimore, was erected in 1674, the tenth county in order of formation, and it is situated in the northeast corner of Maryland, on the borders of Pennsylvania and Delaware, and cut off from the remainder of the state by the Sassafras river on the south, and the Chesapeake bay and Susquehanna river on the west. It is one of the smaller counties in area — 350 square miles — much of which is, however, under water, as it is intersected by several rivers, notably the North East, the Elk, and the Bohemia. The surface throughout is rolling, the northern portion being hilly; this gives considerable water power, which is utilized by a number of large paper, iron, cotton, flour, phosphate, kaolin, and flourspar mills. The third largest pulp and paper mill in the United States is located at Elkton, the county seat. In the eighteenth century the output of pig and bar iron at the Principio Company's furnaces was the largest in America. The soil generally is fertile, varying from a yellow clay in the south to a disintegrated rock in the north, producing fruits, grain, and hay in abundance. So noted has its hay crop become that the highest grade on the Baltimore market is known as "Cecil county hay." Along the Susquehanna river are several large granite quarries, affording the best building material, a stone which, when polished, as is done at Port Deposit, is excelled in beauty by no other. Kaolin is largely worked for use in the manufacture of paper and in porcelain factories, and chrome has been extensively mined. Although possessing such excellent water facilities, marsh land is almost unknown. The banks of the Susquehanna river rise abruptly to a height of from 80 to nearly 600 feet. At Port Deposit the granite banks rise almost perpendicularly 203 to 300 feet. The fisheries, as might be expected, are of much importance. Elkton, the largest town, has about 3,000 inhabitants, followed by Port Deposit, Perryville, Rising Sun, North East, Chesapeake City, and Cecilton. The scenery in places is picturesque in the extreme. That along the Susquehanna, near Conowingo, and on the Octoraro, near Porter's Bridge, attracts artists from a distance, and compares most favorably with the Wissahickon and other rugged streams so often delineated by the painter's brush. The county is about equidistant from Philadelphia and Baltimore, is intersected by the Philadelphia, Wilmington and Baltimore; the Philadelphia division of the Baltimore and Ohio, and the Baltimore Central railroads, also by the Chesapeake and Delaware canal. Cecil county was one of the first to engage in school work. In 1723 the colonial legislature appointed a committee consisting of John Ward, John Dowell, Benjamin Pearce, and others, to open free schools, and they opened one. St. Stephen's Church, organized in 1692, opened a public school about 1734. The Friends' Meeting House at Calvert was organized by William Penn 1702, and soon after opened a school. The church of St. Francis Xavier was organized in 1704, and afterward opened a school. The county in 1859 organized a system of free public schools, thus antedating that of the state six years. Among the more prominent private schools are the West Nottingham Academy, opened about 1741 by Rev. Samuel Finley, who afterward became the president of Princeton University. It is situated near Colora. The Tome Institute, most beautifully situated on the bluff at Port Deposit, presided over by Dr. A. W. Harris, with a corps of 63 teachers, and over 500 pupils, was endowed by the late Jacob Tome with several millions of dollars.